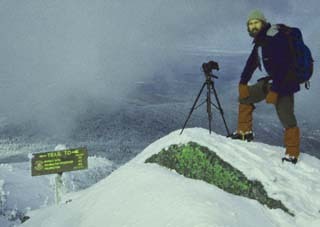 featured photographer for the 2002 Adirondack Mountain Club calendar. has produced several evocative multi-image programs on the Adirondacks. the Adirondack wilderness, and our spiritual connection with the Earth. Darkroom workshops that teach techniques for working with Adobe Photoshop. designed to work around the finest light of the day. the mountains in the winter on a pair of snowshoes. original transparency. Digital files also provide better detail, and can be enlarged to much larger sizes without a loss of clarity. While digital technology can be used to completely change the content of an image, Carl only uses it to reproduce the original image as a print with the best possible color tones and detail. With digital techniques, it is easier to duplicate the subtle tones in the highlights and detail in the shadows and work with the colors and saturation. To produce these prints, each original transparency was scanned to create a digital file and then meticulously cleaned and color corrected on a high end graphics computer. They are printed with a professional Epson 7600 photo quality printer using inks and paper that have an archival life of 70 years or more. All prints are shipped rolled in a tube. which will be sent priority mail. An additional $2.50 may be added per mailing address depending upon the location and quantity.